In 1960, after studying at SMBC, Ruth Myors left Australia to work as a midwife with the Somali people. For over two decades, she worked in a hospital in Somalia, a village in Ethiopia and in radio ministry in Kenya. During this time, government decisions, coups, communist takeovers, natural disasters, sudden deaths and other misfortunes disrupted plans and brought about unexpected changes in Ruth’s life. "This book is an invitation to ‘grab a coffee, pull up a chair, and let me tell you about the God who has been my closest friend in life’. 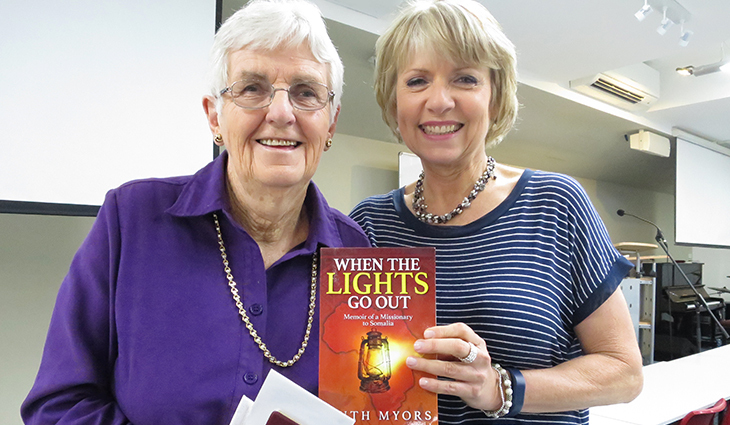 It has the ‘wow’ factor – not about the author and her exploits, but about the God who was always there, in the dark moments as well as the joyful moments … It is a book about culture, about gospel communication, about dealing with change and, above all, about the adequacy of God in all of life. It is a book that will cause you to smile, to reflect, to be amazed, to be encouraged. And remember to grab some tissues when you pull up that chair." "Ruth has been an inspiration to many and a wonderful example, teacher and counsellor to her New Zealand colleagues. From her many years in Somalia and Ethiopia coupled with her qualifications as a psychologist, she has been invaluable in preparing and caring for new and returning missionaries in her ten years of annual visits to New Zealand. Her visits with her colleague Dr Kath Donovan, and peppered with her unique sense of humour, were always a welcome highlight for us." "Ruth pioneered the use of psychological assessment for missionaries in Australia, overcoming initial suspicion from the mission leaders with her professionalism, integrity, warmth, spiritual depth and wit. She, together with Kath, became a loved and highly respected team across Australia. Their model of assessment and debriefing was the gold standard and they became internationally recognised as world leaders in this field. Ruth was the inspiration for me to train as a psychologist. She was a tower of support and encouragement throughout my degree, and then generously mentored me in the art of psychological assessment. Today Ruth’s influence continues as I pass on much of what I learnt from her to my students. I have rarely met someone who has such empathy and inclination to find something positive about even the most ‘difficult’ of people. Her friendship is one of my most treasured possessions." OETJE: "Not only was Ruth a great teacher, she also possessed an enormous love for the Lord and for the Somali people. Besides learning the language, I gained deep insights into the Somali culture from Ruth. She taught me how to live among the Somali people and to be a witness for the gospel." MICHAEL: "Ruth’s down-to-earth wisdom, derived from her varied experiences, provided me much needed spiritual realism. Her emphasis on perseverance in the life-long marathon of sharing the good news with Somalis was particularly helpful. Over the past three decades, Oetje and I have been blessed by frequent letters and emails of encouragement from Ruth, sharing our frustrations, challenges and joys as we see the gospel of Jesus Christ advance among the Somali people." "This personal account resonates with passion for God and people. It bounces with life, with joy and humour, and Ruth shares sadness and pain as well. Like Ruth herself, the book is open, honest, joyful. It is a continuation of that great saga of God’s mission which started in the Acts of the Apostles and continues as God works today through his Spirit. Read it and rejoice. Read it – and be warned. You might be called to write the next chapter." "We found through our many years of missionary service that debriefing was a necessary and helpful means of putting difficulties and successes into perspective when we returned for home assignment and at the end of our term of service. Ruth provided us with a safe and secure place to cry when we needed to express our hurts and affirmation when we needed encouragement. And she was there to rejoice with us in joys and successes. We felt listened to and cared for and we could trust her with our confidences."